During a 1971 strike, Penn Central added twenty-one trains to its regional rail schedule. Most of these new trains shuttled would-be Red Arrow passengers between Penn Center, in downtown Philadelphia, and Overbrook, a Penn Central rail juncture in West Philadelphia served by two bus companies, the Philadelphia Transportation Company that SEPTA acquired in 1968, and the Schuylkill Valley Lines Inc. that SEPTA later acquired in 1976. The UTU strike of 1971, which exposed the lack of transportation demand-management expertise and experience within SEPTA, accelerated the loss of SEPTA system riders to other modes of transportation, particularly cars. 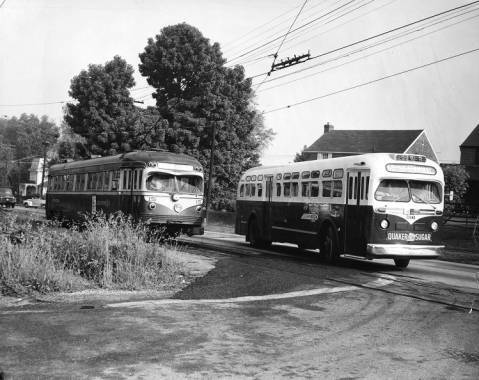 Red Arrow buses increasingly replaced electrified trolleys and traveled new routes in Montgomery and Delaware County as population growth and commercial development sprawled in the 1950s and 1960s from historic commercial and residential corridors such as Lancaster Avenue and Garrett Road to West Chester Pike, Landsdowne Avenue, Providence Road and McDade Boulevard. Uncharacteristic of many railways in the Schuylkill Valley, mature trees, steep slopes, and electric power lines flank this part of the Norristown High Speed Line. 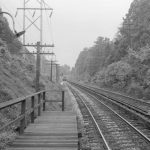 The buffering of the rail route by those natural features enabled rapid rail transit—90 miles per hour at some points—between Norristown and Upper Darby, the county seats of Montgomery and Delaware Counties, respectively, throughout the twentieth century. 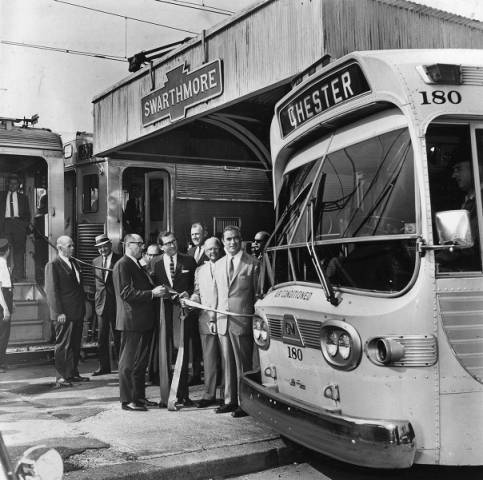 The popularity of bus-rail connections in suburbs such as Swarthmore (site of the pictured ceremony) laid the foundation for SEPTA to make multimodal suburban stations the centerpiece of its infrastructure improvement plans. 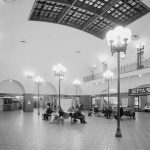 In 1970, SEPTA released “Reconnecting the Region,” a robust proposal for redevelopment of railroad station grounds to make space for bus service provision and passengers. SEPTA’s plans faced stiff opposition from communities committed to historic preservation and the conservation of green space as well as neighbors concerned about newcomers and traffic congestion. Ultimately, neighborhood associations representing inner-ring suburbs of Philadelphia successfully compelled SEPTA to construct multimodal transportation centers in more sparsely populated and less economically stable areas of the region. 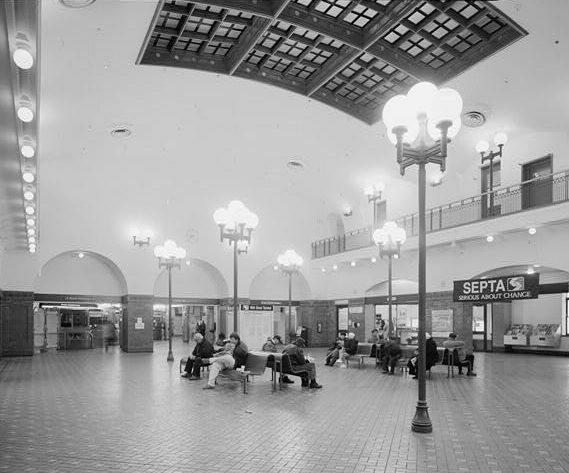 The pristine interior of 69th Street Terminal remained a testament to the glory days of prosperity in suburban transportation after the sale of Red Arrow Lines to SEPTA in 1970. Particularly alluring was the plastered vaulted ceiling that the Taylor family, founders of the Red Arrow Lines, restored in the 1950s. 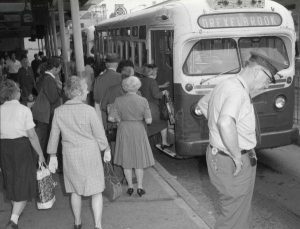 At the 69th Street Terminal in the center of Upper Darby, Delaware County, passengers board Red Arrow buses en route to former trolley stations in outlying residential communities of Delaware and Montgomery County such as Drexelbrook. The Red Arrow Lines of the Philadelphia Suburban Transportation Company (1936-70) became a national model and local brand of marketable mass transit in the 1950s, when few private companies still built, managed, owned, and operated suburban public transportation services, let alone profited from them. At a time when motor-vehicle commuting forced most transit proprietors into bankruptcy, receivership, or acquisition, the Red Arrow Lines–high-speed railways, trackless trolleys, and electrified and diesel buses operated west and south of Philadelphia by Merritt H. Taylor Jr. (1922-2010) and his family of transit managers–outlasted and outshined most national and local competition. Paradoxically, the Philadelphia Suburban Transportation Company cultivated loyal ridership of Red Arrow Lines by curtailing services and closing stations it acquired in 1946 from the beleaguered Philadelphia & Western (P&W) railroad and bus company run by A. Merritt Taylor (1874-1937), Merritt H. Taylor Jr.’s grandfather. Over the next decade, Taylor Jr. removed train services and servicemen from sparsely populated industrial centers of Chester County, Pennsylvania, like Stafford and West Chester, and replaced most trackless trolleys (powered by overhead wires) with diesel-fueled buses better able to navigate the sprawling towns of Montgomery County such as Ardmore and Haverford. Gut renovations of Red Arrow-related real estate in Montgomery and Delaware Counties, including the profitable Norristown High-Speed Line’s Terminals on Sixty-Ninth Street in Upper Darby, Delaware County, and Forty-Ninth Street in Norristown, made room for back-office operations once assigned to branch offices. The redesign of these Art Deco structures left them without amenities like restaurants, lunch counters, barber shops, and passenger waiting rooms, but postwar residents of Philadelphia suburbs patronized Red Arrow Lines regularly enough to support expansion of the Philadelphia Suburban Transportation Company into New Jersey. The lean architecture and infrastructure of Red Arrow Lines included a few luxuries that became the Taylor family legacy. Before aerodynamically-designed Silverliner trains graced commuter rail lines of the Pennsylvania Railroad Company in 1963, the Red Arrow Lines boasted “bullet trains”—refurbished rapid transit cars of early modernist style that picked up and discharged passengers every fifteen minutes, every hour of the day, along the 13.7-mile long Norristown High-Speed Line. These Liberty Liner trains featured vibration dampers and waitstaff, which allowed coffee and tea service during the morning rush hour and beer and wine during the evening rush hour. Less-equipped buses and trolleys earned repeat ridership by traveling in dedicated traffic lanes leading to the Norristown High-Speed Line, express bus stops of the Schuylkill Valley Lines Inc., and rapid-transit terminals of the Philadelphia Transportation Company, as well as commuter rail stations of the Pennsylvania Railroad, Reading Railroad, and the Baltimore and Ohio Railroad companies. Together, the styling, synchronized schedules, exclusive rail and road rights, and intermodal connections of the Red Arrow Lines kept the company in business, in the pages of industry periodicals such as Railway Age, and in popular television shows like 60 Minutes. 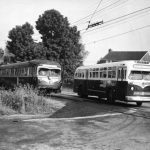 The financial success of the Red Arrow Lines in the 1950s contributed to Merritt Taylor Jr.’s decision to abstain from participating in the Southeastern Pennsylvania Transportation Compact (SEPACT) formed by Philadelphia and four surrounding counties in 1961. Taylor, an active member of Delaware County’s conservative-leaning political organizations, eschewed public subsidies for replacing rolling stock and denounced public-private partnerships in real estate reinvestment throughout his twenty-four-year tenure as Red Arrow Lines’ president. Meanwhile, competitors of the Red Arrow Lines—the Pennsylvania Railroad, Reading Railroad, and the Philadelphia Transportation Company, a local subsidiary of National City Lines Inc.—capitalized on the availability of public funds to cover their ballooning debts and compensate for their reduced ridership. Between 1958 and 1970, Taylor refused to redirect Red Arrow buses and trolleys to commuter rail stations in Media or otherwise participate in projects by SEPACT or SEPTA (the Southeastern Pennsylvania Transportation Authority, formed in 1963) to decrease street traffic and offer discounted direct rail service from the suburbs to Philadelphia’s business district. Taylor’s reticence to join government-business compacts of the 1960s preserved his family’s political alliances in Delaware County, which also opted out of regional transportation compacts orchestrated by Philadelphia’s metropolitan-minded mayors. At the same time, however, the Red Arrow Lines lost revenue to Philadelphia and Montgomery County, which charged the company ever-higher tariffs to use their tunnels, terminals, streets and bridges. Rather than wait until it could no longer compete against the rail ridership recruitment and retention programs of local, state, and federal transportation authorities, Red Arrow leadership elected in 1970 to resell their stake in P&W to SEPTA at a premium of $13.5 million. Red Arrow-decorated trains, trolleys, and buses rolled into Upper Darby terminal of the Norristown High-Speed Line for the first time under SEPTA leadership on January 29, 1970. 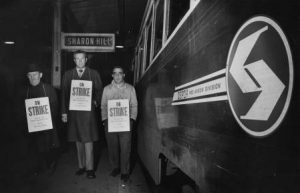 Although authorized by the Taylor family, SEPTA’s takeover of Red Arrow Lines sparked a strike lasting more than a month by Red Arrow employees, many of whom had supported the Taylor family’s sustained opposition to public management, subsidies, and regulation. SEPTA conceded only temporarily to one of their most expensive demands—retention of the Red Arrow workforce that operated, maintained, cleaned, and stocked the luxurious Liberty Liners. Seven years after SEPTA adopted the Red Arrow legacy and logo, it abandoned them to address pressing problems with service delivery, facilities management, and systems integration throughout southeastern Pennsylvania. As SEPTA reduced the Red Arrow Lines to essential sites and services, SEPTA’s Red Arrow Division grew under its first director, Ronald DeGraw (1942-2006), to include the community-based organizations and anchor institutions that restored or repurposed Red Arrow real estate at SEPTA’s behest. 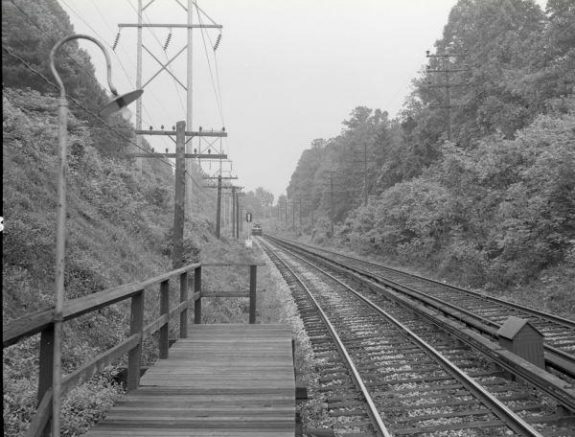 Universities, historical societies, and neighborhood and business associations of Montgomery and Delaware Counties such as the Lower Merion Civic Council and Swarthmore College adapted abandoned rail stations to commercial and civic uses. They converted railways to greenways and sponsored transit services such as shuttles to connect new shopping centers with old Red Arrow stations that had survived budget cuts and abandonment in the early 1980s. Later known as “railbanking,” such nongovernmental efforts to keep Red Arrow infrastructure and architecture in public use enabled SEPTA, their state sponsor, to retain ownership of land that the Taylor family amassed and reserve the right to reuse or redevelop this real estate at a later date. 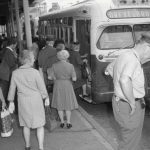 By the end of the 1980s, SEPTA began to reinstate suburban transit routes and services in sprawling towns that the Philadelphia Suburban Transportation Company once served. 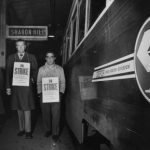 With each reactivation of a Red Arrow right-of-way, the landscape of private enterprise once again became integral to public transportation provision in Greater Philadelphia. Adams, Carolyn T. “Urban Governance and the Control of Infrastructure,” Public Works Management & Policy 11, no. 3 (January 2007): 164-76. Bianco, Martha. “Technological Innovation and the Rise and Fall of Urban Mass Transit,” Journal of Urban History 25, no. 3 (March 1999): 348-78. Green Leigh, Nancey and Sugie Lee. “Philadelphia’s Space in Between: Inner-Ring Suburb Evolution.” Opolis: An International Journal of Suburban and Metropolitan Studies 1, no. 1 (Winter 2005): 13-32. Janas, Leo M. A Tale of Two Suburbs: Zoning, Transportation, and Their Impact on Twentieth Century Wellesley, Massachusetts, and Radnor, Pennsylvania. Ph.D. Diss., Temple University, 1997. Kobrick, Jacob I. “’Let the People Have a Victory’: The Politics of Transportation in Philadelphia, 1946-1984.” Ph.D. Diss. University of Maryland—College Park, 2010. McLarnon, John M. Ruling Suburbia: John J. McClure and the Republican Machine in Delaware County, Pennsylvania. University of Delaware Press, 2003. Harold E. Cox Transportation Collection; Philadelphia Suburban Transportation Company Records; Southeastern Pennsylvania Transportation Authority (SEPTA) Records, 1874-1989; Ron DeGraw Transit Collection; and John F. Tucker Transit History Collection, 1895-1992, Hagley Museum and Library, 298 Buck Road, Wilmington, Del. Correspondence and Files of Mayor Joseph Clark, 1951-1955; Correspondence and Files of Mayor Richardson Dilworth, 1956-1962; and Correspondence & Files of James Tate, 1962-1972, Philadelphia City Archives, 3101 Market Street Suite 150, Philadelphia. General Pamphlet Collection and George D. McDowell Philadelphia Evening Bulletin News Clippings and Photographs Collections, Urban Archives, Special Collections Research Center, Temple University, 1210 Polett Walk, Philadelphia. Newspaper, Photograph and Map Collections, Historical Society of Montgomery County, 1654 DeKalb Street, Norristown, Pa.
69th Street Transportation Center, 6901 Market Street, Upper Darby, Pa.
Norristown Transportation Center, Main & Swede Streets, Norristown, Pa.